is a licensed Physical Therapist and a doctor of physical therapy. She is trained and experienced in treating a wide range of patients, including infants and toddlers, children, adolescents, adults and geriatrics. Her goal simply put, is to achieve superior patient outcomes. Prior to coming to the Reseda Vargo PT clinic, Dr. Kaplan worked as an outpatient physical therapist at a number of clinics in California. She is a certified ASTYM clinician, CPR certified and speaks fluent Spanish. 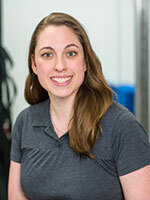 Dr. Kaplan received a bachelor's degree in pre-physical therapy and a master's degree in physical therapy from California State University, Fresno. She went on to earn a doctorate in physical therapy from the University of California, San Francisco and California State University, Fresno Joint Physical Therapy Program. In her training she gained experience through a number of internships at outpatient physical therapy clinics and hospitals including the Kaweah Delta Rehabilitation Hospital in Visalia and the University of California, San Diego Medical Center. Dr. Kaplan gave a podium presentation of her doctorate research "Predicting Fall Risk Using the 30-Foot Walk Test in Low-Functioning Community Dwelling Older Adults" at the 2012 CPTA Annual Conference. She has given a number of other presentations at conferences including the Graduate Research and Creative Activities Symposiums, CSU Fresno, the Annual Scientific and Educational Meeting of the Canadian Association on Gerontology, and the Pan American Congress of the IAGG. When not at work, Dr. Kaplan likes to rock climb and spend time outdoors, do arts and crafts projects, volunteer and spend time with family and her dogs. She also has a penchant for classic cars.